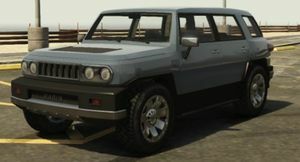 A BeeJay XL in Grand Theft Auto V.
The Karin BeeJay XL (called the BJXL on the vehicle's nameplate) is an SUV in Grand Theft Auto V.
The BeeJay XL is a composite of two Toyota SUVs: the FJ Cruiser and the fifth generation 4Runner. The retro-esque design, nameplate, and front end is based on the FJ Cruiser while the rear of the vehicle is based on the 4Runner. The front grille and hood are loosely based on the Hummer H3. Jimmy De Santa's BeeJay XL. This page was last modified on 20 December 2014, at 01:02.